100 Euro Piles Papercraft	. As we all know, if we talking about money or how to get rich fast, every eyes are pointing at us. The 100 dollar piles responds were so fast, so I made euro currency as well, even made a new category "World Currency" :). Thanks to David for his pointless idea haha. 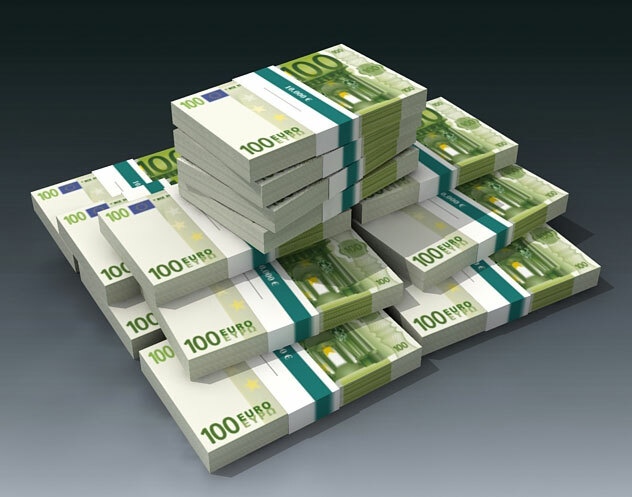 The euro (€) is the official currency of 16 of the 27 member states of the European Union (EU). The states, known collectively as the Eurozone, are Austria, Belgium, Cyprus, Finland, France, Germany, Greece, Ireland, Italy, Luxembourg, Malta, the Netherlands, Portugal, Slovakia, Slovenia, and Spain. The currency is also used in a further five European countries, with and without formal agreements and is consequently used daily by some 327 million Europeans. Over 175 million people worldwide use currencies which are pegged to the euro, including more than 150 million people in Africa.